A couple weeks ago I went apple picking while visiting my best friend. We spent the early afternoon wandering a local orchard picking apples and discussing what we wanted to make with them. A variety of options came up such as apple pie or apple butter, but my favorite that I knew I had to make was apple crisp. I have vivid memories growing up of my mom making apple crisp, it was my favorite fall desserts. I love it so much I even eat it for breakfast. The other apple dishes on my list are going to get made in time, but for old times sake I had to make my favorite of all dishes. I still have plenty of apples left, I will definitely be making another batch of this by the end of the week. 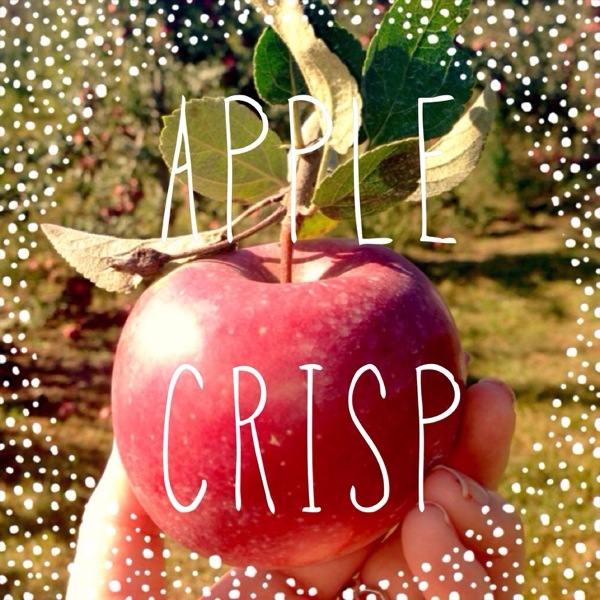 What is your favorite fall apple dish? I made this recipe with sweet apples (macoon's and mackintosh's) because of this it is best to alter the recipe. Put in a little less sugar, I used 1/2 cup + 1/8 cup of dark brown sugar, and add a tsp of lemon juice. This prevents the dish from becoming too sickly sweet (by all means you can skip this part if you like super sweet desserts). I also nixed the addition of walnuts / pecan's, not because I don't like them, because I just did not have enough in the house. I love the nutty flavor and crunch that the walnuts / pecans add, but the dish is still great without them. 5 large tart apples, preferably Granny Smith, unpeeled, halved and cored. Preheat oven to 350 degrees F and adjust the rack to the middle level. Butter an 11 inch pie plate or a 2 quart soufflé dish. Slice apples. 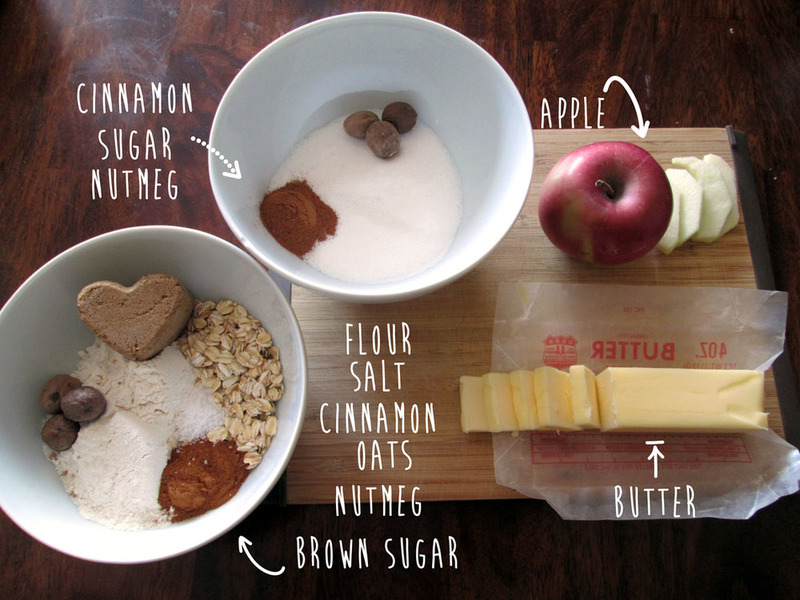 In a large bowl mis the sliced apples with the sugar, 1 tsp cinnamon and 1/2 tsp nutmeg. (If the apples are sweet, decrease the sugar and add 1 tsp lemon juice). Layer apples in the prepared baking dish. Coarsely chop nuts. In another large bowl add the chopped nuts, flour, salt, brown sugar, butter, rolled oats and remaining cinnamon and nutmeg. Mix with a pastry blender or in a Cuisinart until the butter is the size of small peas. Spread the mixture over the apples, pressing around the edges of the dish. Bake for 1 hour or until it is brown and crispy. Serve warm or at room temperature with vanilla ice cream. This past weekend was my boyfriend's birthday, he spent the weekend away for a bachelor party, so I decided to surprise him when he got home with a massive birthday cake. Typically his favorite dessert is Pecan Pie, but we made that for Labor Day weekend, so I decided to change it up (talked about here). The weather has started to get colder already (I am not mentally prepared for it), so I decided to go full fledged fall with a pumpkin cake topped with cream cheese frosting. The cake came out wonderful and fluffy, perfect for cold fall nights and holiday parties. It would taste delicious paired with a warm bourbon (boyfriends suggestion) or hot chocolate. 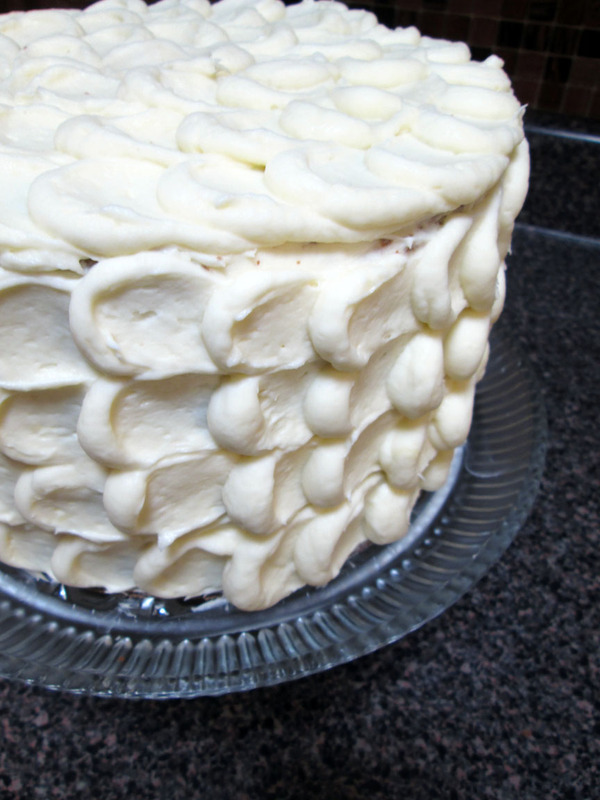 The spiced cake is balanced out by the fluffy cream cheese frosting. The original recipe I used was made for cupcakes but I adapted it to create two 8" cakes. If you would like to change up the filling (I just used plain cream cheese frosting) you could do a cinnamon or maple cream cheese frosting, which would taste amazing. The other thought I had for filling was dulce de leche, the sweet caramel flavor would go great with the spiced cake. This cake was a hit with the birthday boy and friends, I definitely think I will make it again over the holidays. Preheat oven to 350 degrees F. Prep cake pans by coating them with butter then flour. With an electric mixer on medium-high speed, cream butter and brown sugar until pale and fluffy. Add eggs, one at a time, beating until each is incorporated, scraping down the sides of the bowl as needed. Reduce speed to low. Add flour mixture in three batches, alternating with two additions of buttermilk and beating until just combined. Add pumpkin; beat until just combined. Divide the batter evenly between two 8" cake pans, filling each halfway full. Smooth over the top to even out the batter. Bake, rotating cake pans halfway through, until golden brown and a cake tester comes out clean, 40-50 minutes. Transfer to wire racks to cool for 20 minutes. If the top is not level, lightly press the top of the cake using a paper town to even out the top. When cool use a knife to loosen the edge then flip over onto wax paper to release. To finish, use an offset spatula or pastry bag fitted with a decorated tip to top the cake with cream cheese frosting (recipe below). With an electric mixer on medium-high, beat the butter and cream cheese until fluffy, 2-3 minutes. Reduce speed to low. Add sugar, 1/2 cup at a time, add vanilla. 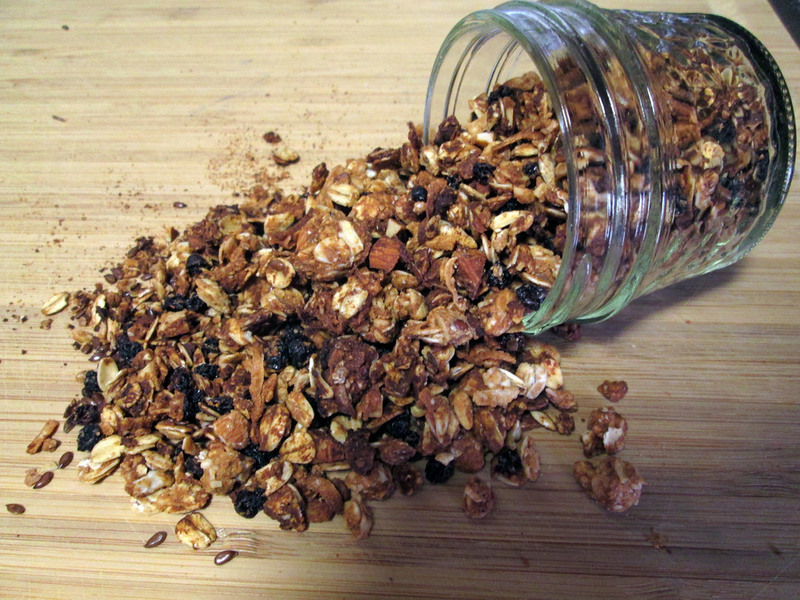 Mix until smooth and combined, scraping down the sides of the bowl as needed. If not using immediately, frosting can be refrigerated for up to 3 days in an airtight container. Before using bring to room temperature and beat on a low speed until smooth again. My boyfriend and I invited some friends up to the lake house to enjoy labor day weekend. To mark the occasion I decided to make some pecan pie (it is my boyfriend's favorite kind) . 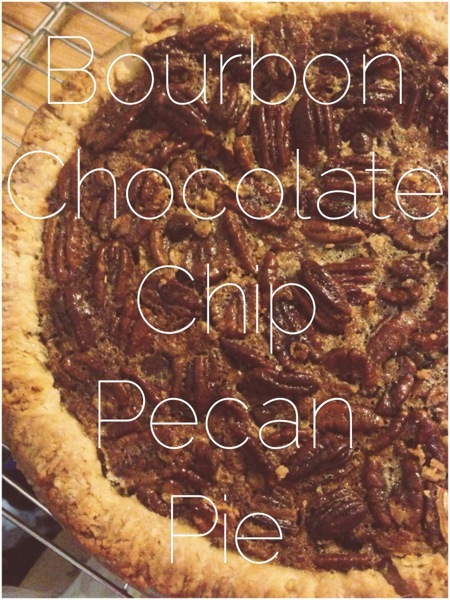 I found a great recipe for Bourbon Chocolate Chip Pecan Pie and I made it over the course of a few days. First I made the pie dough, which needs to be refrigerated for 30 minutes - 2 days. Then the next night I rolled the pie dough and put it in the pie plate, which again had to be refrigerated for 30 minutes - 2 days. Then finally I made the pie and let it cool overnight, in the morning it was ready to bring to the lake house. The only changes that I would make the next time is add more bourbon to make the flavor more distinct (a suggestion from my boyfriend). Also, instead of mixing the chocolate chips into the filling I would sprinkle them over the top after the filling was in the crust. We found that most of the chocolate chips sank to the middle and bottom after it was poured into the crust. Sprinkling them over the top will help them be more evenly distributed. Making pie is definitely a labor of love, but I wouldn't trade it for the world. This pie was perfectly crunchy and gooey. I cannot wait to make it again. What is your favorite pie to eat? The weather recently has been quite chilly for August, which has lead me to crave warm and comforting foods. The other night my boyfriend made a large pot of sausage and peppers, one of my favorite comfort dishes (let's be real pretty much all comfort food is my favorite). Sausage and peppers is one of those flexible dishes. You can serve it alone with crusty bread or on top of pasta or even on a roll to create a delicious sandwich. I wouldn't mind having it in any form multiple days in a week. The other night we just had it simply on a plate with crusty bread and it was delicious. When I have it for left overs I am going to make it into a sandwich and there was even some left over sauce which my boyfriend is going to use in a chicken dish tonight. I am always a fan of finding ways to mix up dishes to help eating leftovers feel less repetitive. What is your favorite way to mix up leftovers? 1 Cubanelle Pepper - halved, deseeded & sliced. On high heat put 2 tbsps EVOO into a straight sided skillet. Brown the sausage on all sides, approximately 1-2 minutes per side (they do not need to be cooked through). Take out sausage and put on a plate for later. Add the sliced peppers and onion to the skillet. Sauté on high for 5-10 minutes until onion start to become translucent. Add the sliced garlic to the skillet, cook for 3-4 minutes until garlic begins to slightly brown. Take the pan off the heat, add the red wine, return to the heat. Stir, scraping the bottom with a wooden spatula. Cook down the liquid until almost completely evaporated, about 2 minutes. Add the crushed tomatoes, chicken stock, thyme and sausage. Turn the heat down to low. Simmer for approximately 45-60 minutes, stirring occasionally, until sauce has reduced and sausage is cooked through. Add salt and pepper to taste. I must confess, pasta is my favorite meal. 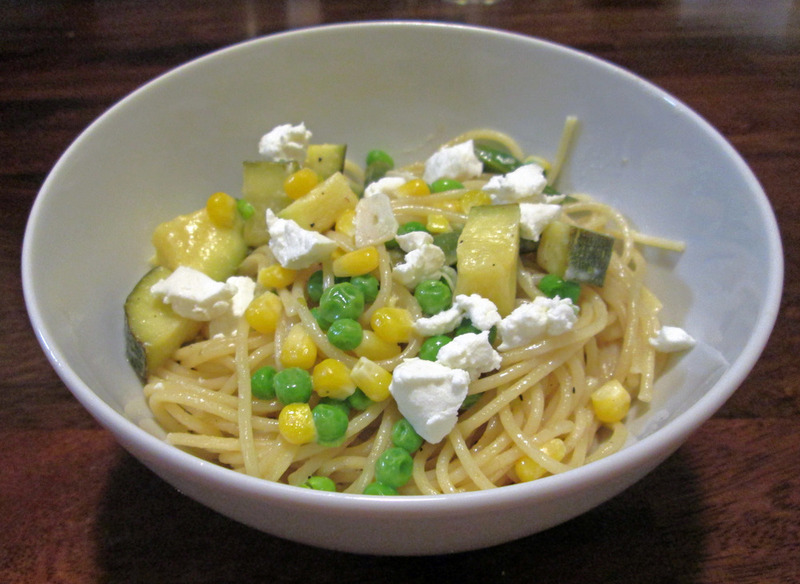 I posted last week a one pot pasta recipe that I adapted from Martha Stewart. This past week my boyfriend created a new pasta dish for us to try. 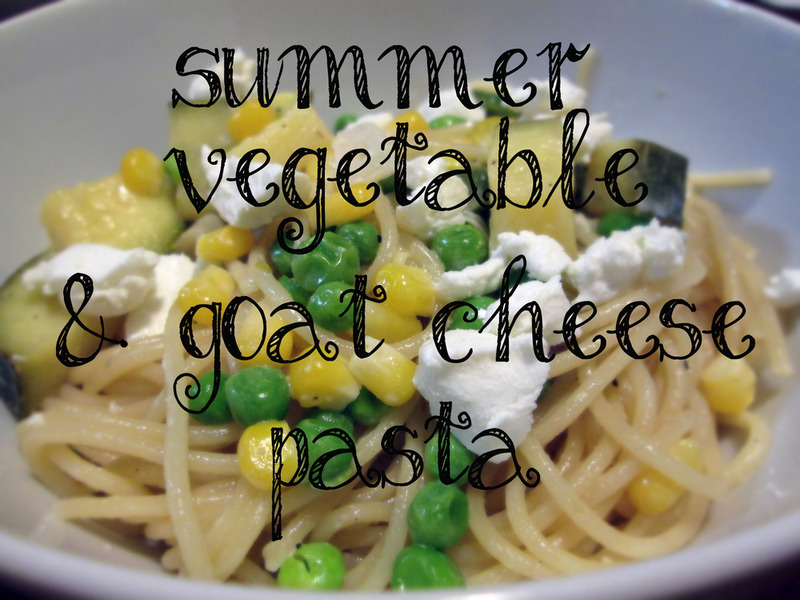 He developed a summer vegetable and goat cheese pasta based on a cover of Real Simple he saw, that I had lying around the apartment. During the summer I always try to get my fill of summer vegetables while they are at their prime. He used zucchini (my favorite), green beans and then added some frozen peas and corn that we had hanging around the freezer. He dressed the spaghetti in a light white wine goat cheese sauce, and finished it off with a sprinkling of crumbled goat cheese. The goat cheese is light and tangy, which is refreshing in the summer heat. If you so desire, you could always add some protein to the dish in the form of chicken, shrimp or whatever you prefer. I hope you enjoy this dish as much as we did. I hope we get to make it again soon before the summer is over. Cook the pasta until al dente, reserve 1/4 cup of pasta water for later. Drain pasta and place cooked back into the pasta pot to hold for later. In a saute pan on high heat put 2 tbsps EVOO, add the green beans and zucchini and saute for about 1 minute. Add the garlic and cook until fragrant, not brown, about 1 minute. Take the pan off the heat. Add the white wine. Return to the heat. Stir vegetables scraping the bottom of the pan with a wooden spatula or spoon. Add the frozen peas and corn. Cook for 2-3 minutes. Add heavy cream and goat cheese. Stir until the goat cheese melts. Reduce the liquid until large bubble form. Add the reserved pasta water, stir. Season with salt, pepper and lemon juice to taste. Add the sauce and vegetables to the pasta in the pasta pot. Combine. Serve, garnish with crumbled goat cheese and/or grated Parmesan cheese. Sometimes the last thing I want to do when I get home from work is cook dinner. Don't get me wrong, I love to cook, but when you have been away from the house for 12 hours you don't want to have to think about lifting another finger. One pot pasta is like a gift from the lazy gods. There is minimal preparation, even less clean up and you come away with a delicious meal that will even impress your friends (at least I managed to impress mine with it). I originally saw the recipe for one-pan pasta in Martha Stewart Living a couple months ago. I loved the concept. All the ingredients in one pot and BAM! pasta with sauce done in less time then it takes to get delivery. I tried the Martha Stewart recipe, it was okay, but I felt like it was lacking some flavor and for me the pasta was a little over cooked. The second time around I tweaked the recipe to make it more flavorful and to work with ingredients I currently had in my pantry. Here is the version I adapted from the original. Doesn't it look delicious? I want to just eat it off the page. I call my version my one pot pasta, because I found my linguine didn't fit well in my large straight sided skillet, instead I used my large pasta pot. I also added the entire 16 oz box of linguine instead of just 12 oz, the more the merrier. To give the pasta more flavor I swapped out the water for chicken stock (you can use vegetable broth if you prefer). 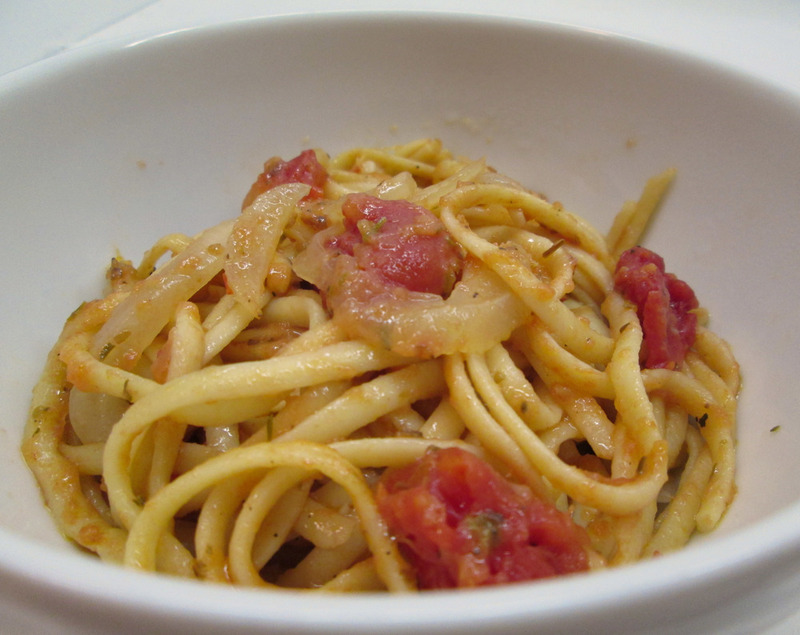 I had no fresh cherry tomatoes or basil in the house so I used a can of diced tomatoes and a little oregano instead. Since I felt that the pasta was a little over cooked the last time I made it, I waited until the pot was simmering for a minute before I added the linguine. 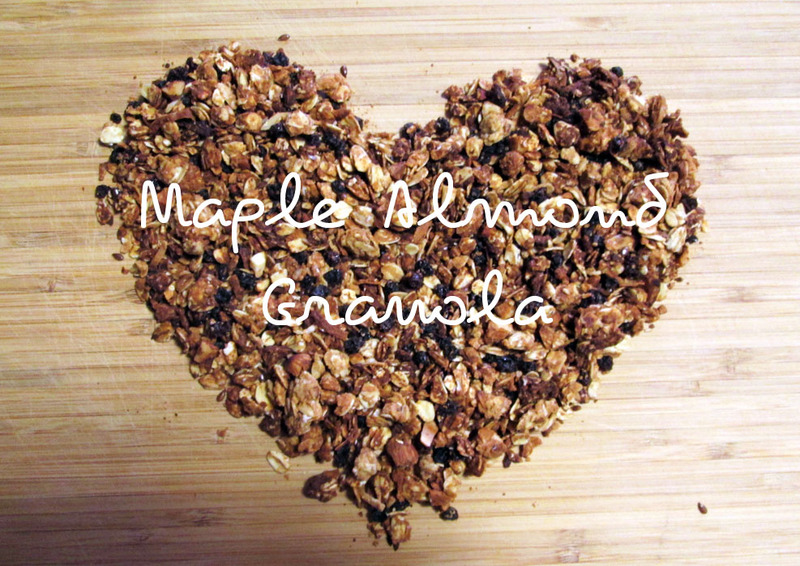 I love that I can adapt this recipe to what I have on hand in my pantry. This is definitely a good recipe to keep in your arsenal for when you just want a quick dinner on a busy night. I hope you enjoy it as much as I did. Add the can of tomatoes, onion, garlic, red pepper flakes, oregano, chicken broth, olive oil, salt and pepper to a large pasta pot. Cover, bring to a boil. Once the pot is boiling add the linguine and simmer for about 9 minutes, until pasta is al dente and you have about 1- 1 1/2 inches of liquid left in the bottom. Serve, garnish with fresh basil & parmesan. ** Note: You can use fresh cherry or grape tomatoes, halved or quartered if large, in lieu of the can of diced tomatoes. If you do this add ½ cup more of chicken stock to the pot. ** Note: You can also add the fresh Basil to the pot before cooking as well as garnish with it.